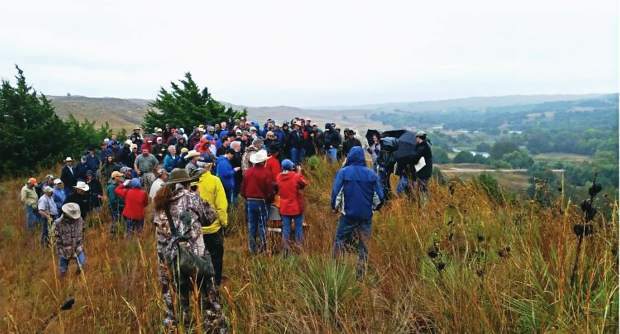 The eighth Annual Private Lands Partners Day was held Sept. 22 – 24 in the Nebraska Sandhills. It was hosted by the Sandhills Task Force, US Fish and Wildlife Service’s Partners for Fish and Wildlife Program, and a nationwide landowner group called Partners for Conservation and it was sponsored by many conservation organizations. It was a national gathering of private landowners and conservation partners from government agencies and nonprofit organizations designed to promote landscape level, voluntary collaborations to ensure that working landscapes continue to provide for both people and nature. Nearly 200 people were in attendance representing 30 states; a record attendance level. Roughly half of the attendees were landowners or managers and half were conservationists. Dan Ashe, Director of the US Fish and Wildlife Service, along with several of their Regional Directors and Headquarters staff attended the event. Also in attendance was Nebraska Lieutenant Governor, Mike Foley; Nebraska Game and Parks Commission Director, Jim Douglas; and Nebraska Natural Resources Conservation Service State Conservationist, Craig Derickson. Participants gained knowledge about the Sandhills during a tour on Wednesday which included stops along the Dismal River, at a water control structure near Brownlee, and a lake near Seneca. Speakers during the tour shared information about Sandhills hydrology/geology, eastern red cedar invasion, grazing plans/ranch management, conservation easements, conservation partnerships, stream/wetland restorations, lake renovations, and more. The evening was wrapped up at the Seneca Community Building with a prime rib feed and the sharing of “Sandhills lore” as told by A.B. Cox and Sandy Hanson. On Thursday, participants listened to presentations given by landowners from Nebraska and many other states including Alabama, Arizona, South Dakota, Montana, and Colorado. Each story talked about conservation and the benefits of using a partnership approach in their different landscapes. Chris Higgins from the Higgins Ranch located between Valentine and Thedford shared their multi-generational sandhills ranching story. Holistic Resource Management training transformed their way of thinking and inspired them to increase their grazing management level and implement some conservation practices that would help their forage and soil resources. Drought tolerance and a healthy rangeland ecosystem are just a couple of benefits they have achieved. They utilized assistance from several conservation agencies and organizations to reach their goals. Lyle Perman from South Dakota shared his story of expanding his ranch to include his son Luke and family in the operation. Grassland in their area is commonly converted to cropland but the Perman’s feel the land should remain as grass and is well suited for raising livestock and providing wildlife habitat. Lyle takes time to share his story of learning from conservation partners with other ranchers across the nation. Private Lands Partners Day is hosted in a different state each year. This year was a great opportunity to share with a national audience the wonders of the Nebraska Sandhills; the rich ranching heritage, contiguous grassland, abundant water supply, and a successful grassroots partnership model. Nebraska is proud of its conservation community and values private landowners and their aptitude to care for their land.